Device Global Technology SA (Pty) Ltd was established in 2002 by Device Global, an international IT services company based in the Netherlands with operations across Europe. The core business of Device Global has always been reverse logistics and refurbishing. IT equipment that reached the end of its leasing period or useful life needed to be removed from corporations to make place for new equipment. Most of this used equipment still had financial value. In a short period Device Global became a leader in the business of refurbishing and remarketing of IT equipment. As for the assets that had no financial value, Device Global covered the disposal of such assets in an environmentally responsible manner. Device SA had the privilege of combining the highly efficient and productive structures of its European parent company with the flexibility and ingenuity required in the South African market. 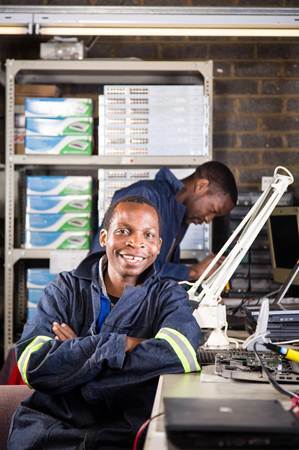 Device SA quickly positioned itself as a leading company in South Africa in refurbished IT equipment – bringing a new philosophy into the local market by establishing a sense of trust. The “voetstoots” dealers and the “hot” items traders found themselves outmaneuvered by value-added services, extended warranty, a reliable source of supplies, and outstanding after sales services. In April 2005 Device South Africa was bought by its managing director. This change of ownership strengthened Device SA’s position, not only in sales of refurbished IT equipment, but it also provided an opportunity to truly utilize Device SA’s outstanding infrastructure and comprehensive approach in reverse IT logistics to locally procure high volumes. Device SA has grown substantially since its change of ownership in 2005. On the IT take back side there has been massive growth in both the number and scale of projects undertaken. On the sales side the availability of such large quantities of stock has enabled the growth of sales both on a supplier and customer level. Device SA looks forward to a future of continued growth and development in the South African IT sector.